Have you ever eaten at a rotating gourmet restaurant on top of a 28 story hotel? 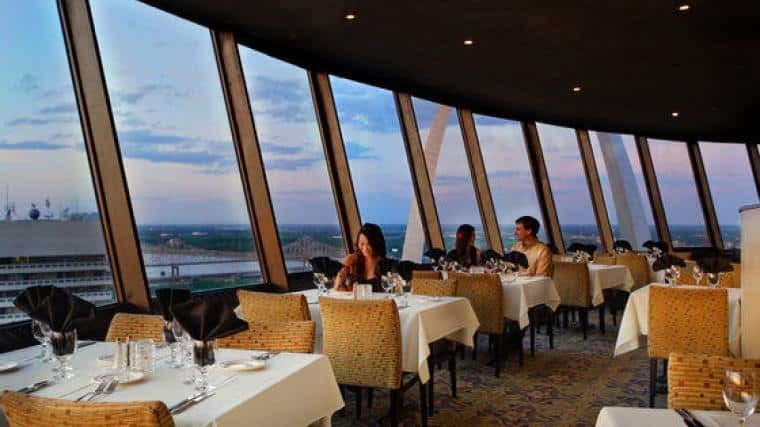 I was in St. Louis on business a couple months ago, and had the opportunity to dine at Top of the Riverfront on the 28th floor of the Millennium Hotel. Sounds fancy right? It was fancy, but also really cool, and different than any other restaurant I’ve been to, mostly due to the fact that the restaurant rotated 360 degrees. What a beautiful way to see downtown St. Louis at sunset. From hors d’oeuvres like Prawn Martini and Asian Duck Tacos, entrees including Seared Diver Scallops and Duck Confit, and (don’t forget) a dessert display that will knock your socks off, their menu has an endless assortment of original and delicious options. The whole point of the restaurant is that it rotates and you get a full picture of downtown St.Louis from atop the hotel. The views are spectacular, and we were lucky see the skyline while it was light and dark. Beautiful! Just make sure you’re facing the right direction if going backwards makes you queasy…. About half way through dinner I looked down and my stomach dropped because my purse was missing! There was no one behind us and I knew I had brought it into the restaurant, so where the heck was it? After about 45 seconds of panicking thinking, it occurred to me that a foot of the floor against the outer wall of the restaurant wasn’t moving. I’m sure my dinner guests thought I was crazy when I got up from the table, scurried around to the edge of the wall, and then followed it until I found my purse, slowly moseying along the exterior of the restaurant floor. We all had a good laugh at my expense! Update: Appears the Top of the Riverfront restaurant has closed since my last visit, but St. Louis is looking to bring it back!